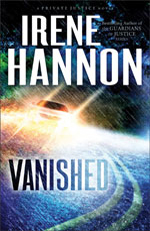 My latest great read is a book by Irene Hannon : Vanished. This is my second book by Irene Hannon and I really enjoyed this story!! This is the first in her new trilogy The Private Justice Novels. The main characters in this story are Moira and Cal. Moira is a investigative reporter who has an accident while driving home on a rainy night. There are many details that lead her to hire a private investigator, Cal, to help her figure out the mystery. While working together, both share their information about their past and also learn to open up to each other. I really enjoyed the depth of the characters in this story, and felt they were easy to relate to very quickly, they were he type of people you could see being your friends in real life. Both Cal and Moira demonstrated an amazing amount of character and integrity while making choices through the story. I enjoyed watching he relationship between Cal and his fellow PI’s too, they all hold he same values and moral integrity, but joke and rib each other as well. There is a great deal of mystery in this story, that will keep you wondering what happened that night in the rain. If you like a story that weaves a bit of romance with some intrigue and suspense this is the book for you! I am already looking forward to following this book with the next installment in this series!! NOTE : I was offered a copy of Vanished, at no cost, in exchange for an honest review, by Revell Publishers. So glad you enjoyed the book, Janelle. Thanks for reviewing!